Today, work has been busy we wanted a quick and easy tea. 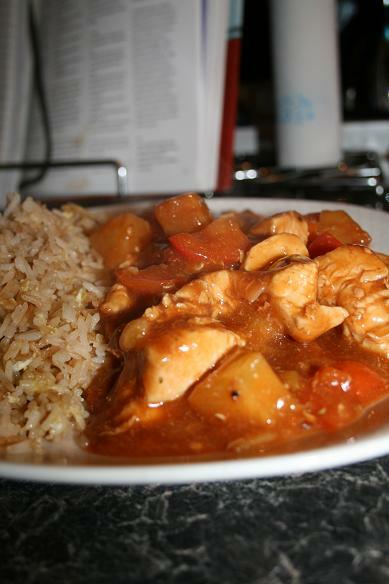 I’ve never made proper sweet & sour chicken before as 1) the list of ingredients scared me and 2) never had all the ingredients. As I was flicking through old cookbooks at the weekend I came across a recipe for sweet & sour in The Nation’s Favourite Food. I did adapt the recipe slightly. I served it with egg fried rice and it was far nicer than I was expecting. Hubby commented as how it was just as good as the takeaway version. This is even quicker to make than ordering one and probably a great deal healthier. 1) Heat oil in wok, add chicken, peppers, garlic and ginger then fry for 3 min. Add spring onions plus pineapple and stirfry for a further 30 sec. 2) Add all the sauce ingredients, bring to the boil then simmer for 6 min. Season with pepper. I find the usual sausage dishes can get a bit boring after a while, so tonight decided to some chilli flecked sausages (called Rudolf’s Revenge) from the farm shop and turn them into a meatloaf. The only memories I have of meatloaf aren’t particularly pleasant ones, but I’m glad to say tonight’s meatloaf was far better than I expected. The recipe is a mix of recipes I’ve come across. Can’t be bad as Hubby has asked if I will cook it again soon. 1) Preheat oven to 160oc. Lightly fry onions until soft. In a bowl mix all meatloaf ingredients (including onion) until well combined. Press into 1lb loaf tin. Bake for 55min. 2) Fry bacon until crispy then fry topping breadcrumbs for 2 min until golden. In bowl mix with cheese and bacon. 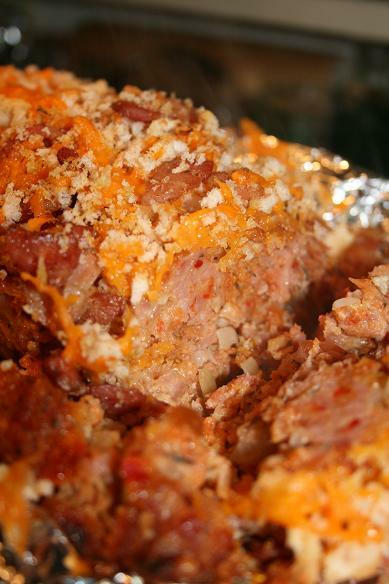 Sprinkle on the top of the meatloaf and bake for a further 5 min, until cheese has melted. Allow to stand for 10 min before serving and slicing. I can cook the perfect roast pork and beef, but get me to cook the perfect roast lamb and you can forget it. I just can’t master it. Tonight, as it’s Sunday, was a traditional pork roast dinner. 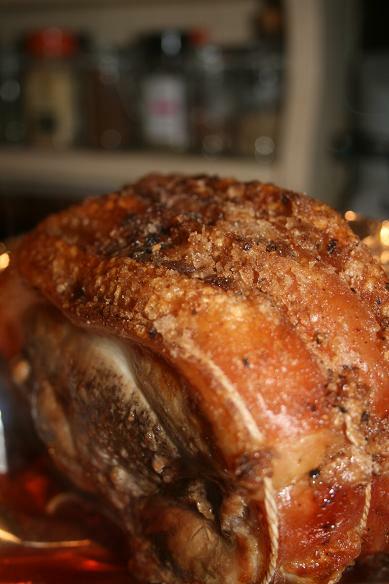 I love my roast dinners and today I cooked probably the best crackling. After my last roast dinner success of Yorkshire puddings I put my crackling success down to Mellow Yellow rapeseed oil, yet again. Today I also discovered that if you sprinkle polenta on potatoes before you put them in the oven you end up with beautifully crispy potatoes. We ate it with roast potatoes, carrots and parsnips that had been roasted in some roasting oil I had picked up at a farmers market last week, garlic & herb stuffing plus Yorkshire puds. I know you shouldn’t have Yorkshire puds unless you having beef, but I love them! 1) Get pork joint out of the fridge, uncover to allow air to get to the skin. Score skin of pork with sharp knife. Sit for an hour. Pour boiling water over the skin and leave for around 15 min. 2) Preheat oven to 240oc. Rub olive or rapeseed oil into the skin then massage in lots of salt. Cook for 25 min at 240oc. Turn down oven to 190oc and continue to cook (TOTAL TIME = 35min per lb/450g) until juices run clear. 3) Rest for 30 min before carving. This allows you to turn the oven back up a bit to cook the potatoes etc…. We have a very good pub within walking distance (or should that be staggering distance!) from our house. The menu is unlike the traditional pub grub menus that all the other pubs seem to serve around here. It certainly isn’t cheap by any means, but it really nice for a treat. Tonight hubby decided to treat me. I more often than not choose the veggie dish when I’m eating out, but tonight the one veggie dish was uninspiring and I didn’t fancy any of the run-the-mill dishes so decided to be brave and eat something I’ve never eaten before, venison. Venison on a bed of butternut squash and mustard mash with juniper berry jus. 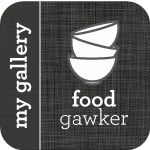 – I was expecting the venison to have a gamey taste, but instead it was like eating a really strong tasting beef steak. The butternut squash and mustard was the perfect accompaniment. Chocolate and biscuit terrine served with cappuccino mousse – Nice, but I would have made it completely differently. I was expecting the terrine to be crunchier, but instead it had been set in a kind of chocolate jelly. Scallops with tomato and garlic salsa and rocket – I had a taste as I’ve never eaten seafood before (apart from chip shop fish!). The taste was ok, but I really wasn’t keen on the texture. To me it was like eating the fat on a pork chop (I’m not a big fat fan to start with). Hubby loved them. Fillet of pork wrapped in pancetta served with black pudding and braised apples. – I didn’t taste taste this, but hubby said it was delicious. Creme Brulee – You can’t go wrong with a traditional creme brulee. As tomorrow is Stir-up Sunday I’ve been soaking various fruit in Guinness ready to make the Christmas pud that featured in last months GFM. The snow was a fleeting visit and it had melted by this morning…much to my disappointment! Last week Amanda at Little Foodies posted a natural cold remedy. As I think I’m beginning to come down with a cold I decided to give the recipe a go after work today. It was really soothing and far nicer than Lemsip. Next time I’m going to try and brave more ginger. The microwave in work has now been fixed so I’m taking hot lunches again. 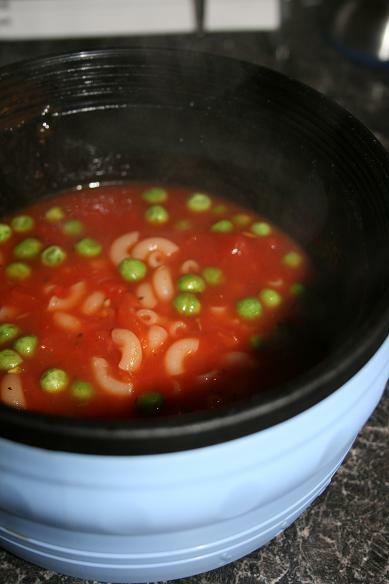 I often eat this cheats minestrone for lunch as it is filling and made in 10 minutes. In reality this is nothing like true minestrone, but hey it tastes good! 1) Bring the tomato and stock to the boil then add the pasta. Simmer for 4 minutes. Add veg and simmer for a further 2 minutes. Stir in pesto. The weather here has been bitterly cold and sleeting all day, so much so we’ve had a fire going since 2pm. Usually we don’t light it until around 5pm. Saying this I did get a bit of a shock 10 minutes ago when I went outside to put the rubbish out to find a thick covering of snow! Rosie & Maria have set a cooking challenge called The Great British Pudding Challenge. This months challenge is Chocolate Steamed Pudding (you can find the recipe on Rosie’s blog) and I was never going to turn down the chance to cook a chocolate pudding! Apparently the traditional British pud is in decline and the idea of the challenge is promote awareness of the fantastic puds on available in the UK. 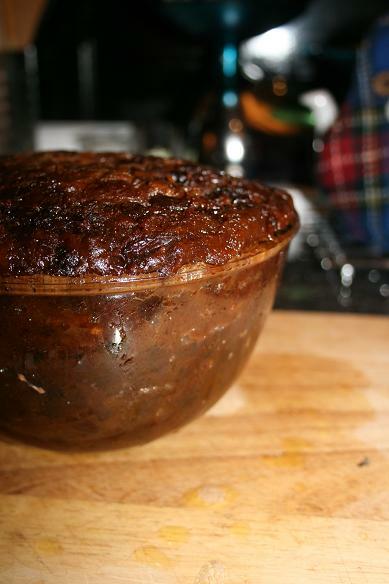 This is the first proper steamed pud I’ve made and the steamer I own isn’t big enough so cooked it the way Gordon Ramsey advises in his Just Desserts book; in a large pan with boiling water about half way up the pudding bowl. It seemed to work and the pudding was beautifully light and not too sweet. To accompany the pudding, rather than the chocolate sauce that Rosie made I made custard. This is the first time I have made custard from scratch and was pleased with the results. But I admit there is times when totally fake Ambrosia custard is called for! 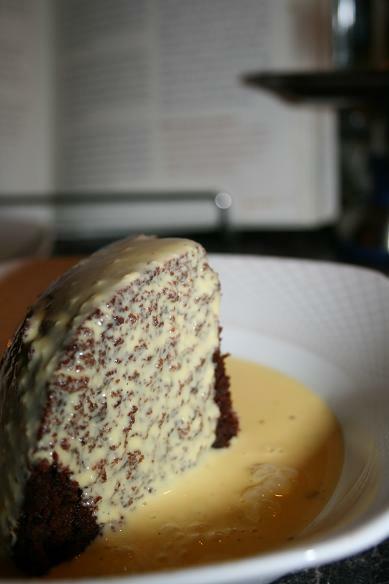 The custard recipe is adapted from River Cottage Family Cookbook. 1)Pour milk and cream into saucepan, add vanilla seeds. Heat gently until cream and milk begins to steam. Take off the heat. 2)Whisk egg and sugar together for about a minute. Pour the hot milk/cream into egg mix and quickly whisk. Pour back into the saucepan and gently heat. Stir with a wooden spoon constantly. 3) Once the custard evenly coats he back of the spoon, you can run your finger down the back of the spoon and the line stays distinct the custard is ready. According to Hugh this happens at 78oc. Strain the custard into a jug. Today is Children in Need and in school we had a Strictly Come Dancing day. All of us staff were dolled up with ball gowns and tiaras and I certainly got some odd looks while I was defrosting my car this morning! 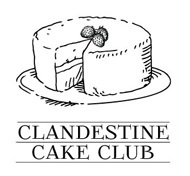 To raise money we had a cake stall. I made some cinder toffee, boiled fruit cake and some thumbprint cookies. I’ve never made thumbprint cookies before, but was inspired by some I saw on tastespotting a couple of weeks ago. The cookies tasted nice, but I made the huge mistake of using cheap cheap jam and it just wouldn’t do anything but sit there in a horrible looking blob. Next time I’ll use decent jam. 2) Refrigerate dough for 30 minutes. Line 2 baking trays. 3) Take about a teaspoon worth of dough and shape into a ball. Place on baking sheet and press firmly in the middle with your thumb. Continue with the rest of the dough. Place 2 inches apart. 4) Bake for 8 minutes. 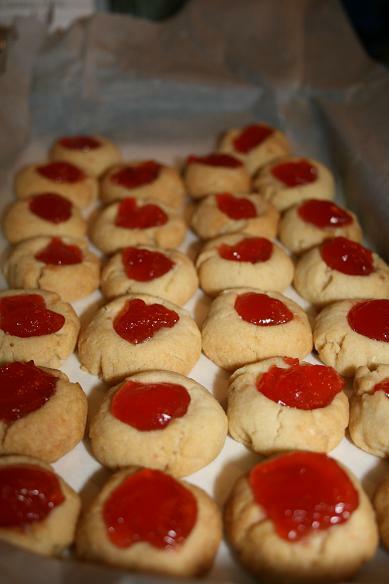 Take out of the oven and put about 1/4 tsp of jam in the cookie thumbprint. Return to the oven for 7 minutes or until beginning to lightly brown on the edges. Cool on baking rack. Tonight’s dinners harks back from the days when I had only just discovered cooking from scratch. It’s not exactly the most sophisticated dish, but it’s cheap, healthy and delicious. The recipe does sometimes vary depending as to what I have in. I’ve been known to add baby corn, peppers or snap peas to the sauce. 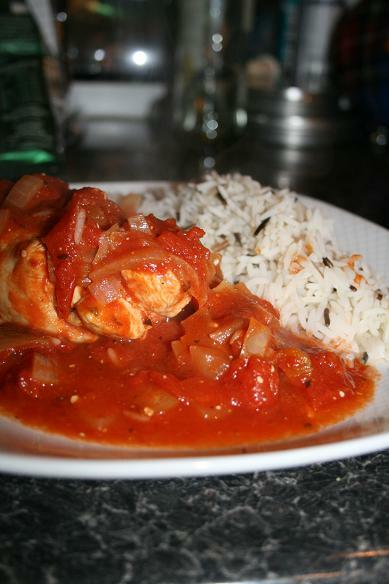 1) Prepare chicken fillets by cutting a slit into the thickest part and stuff in as much feta as you can. 2) Fry onions in medium saucepan until softened. Place chicken on top of onions. In separate bowl mix chopped toms, oxo cube, herbs and seasoning. Pour sauce over the chicken. Put lid on saucepan and simmer for 25 min. Turn chicken over half way through cooking. 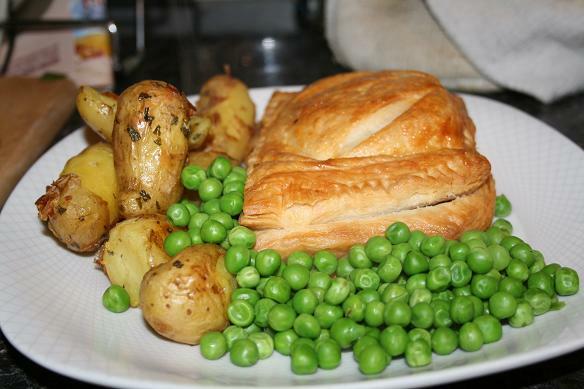 I first tasted Beef Wellington at a friends wedding last year and it was delicious, only now have I gained the confidence to try it my self. Some recipes suggest using fois gras, but I decided to go for the non-fois gras version as 1) it’s a great deal cheaper and 2) I won’t eat fois gras. It was a great deal easier than I thought, however I did over cook the steak so it was more well done that I would have liked, but I’ll know for next time. 2) Roughly chop mushrooms (I pulsed them in a blender. Heat oil & butter and fry mushrooms and thyme for around 10 min until soft. Season with salt & pepper. Pour in wine and cook for a further 10 min until wine has been absorbed. Allow to cool. 3) Roll out dough, then cut into 2 lengths. Put 1 tbsp of the mushroom mix (duxelle) into the 2nd quarter of the pastry length. Place steak on top then put another tbsp of duxelle on top. Fold pastry over and use a fork to seal the edges. Repeat with the other steak. Place in the fridge for 30 min. 4) Preheat oven to 200oc. Brush pastry with a beaten egg then bake for 20-25 min until golden.